This is one of the easiest recipes to make and looks and tastes amazing!! 🙂 It is perfect healthier option for Christmas chocolates and Christmas platters as it looks impressively festive ! The recipe only takes about 15 minutes and is raw, refined sugar free, paleo and packed full of superfoods. It is also super flexible so you can throw on top any dried fruit, nuts or berries you have sitting around. Gently melt coconut oil in pot, turn off element and mix in cacao, sweetener and vanilla. Pour onto baking paper laden tray with ridged sides (so choc doesn’t run off). 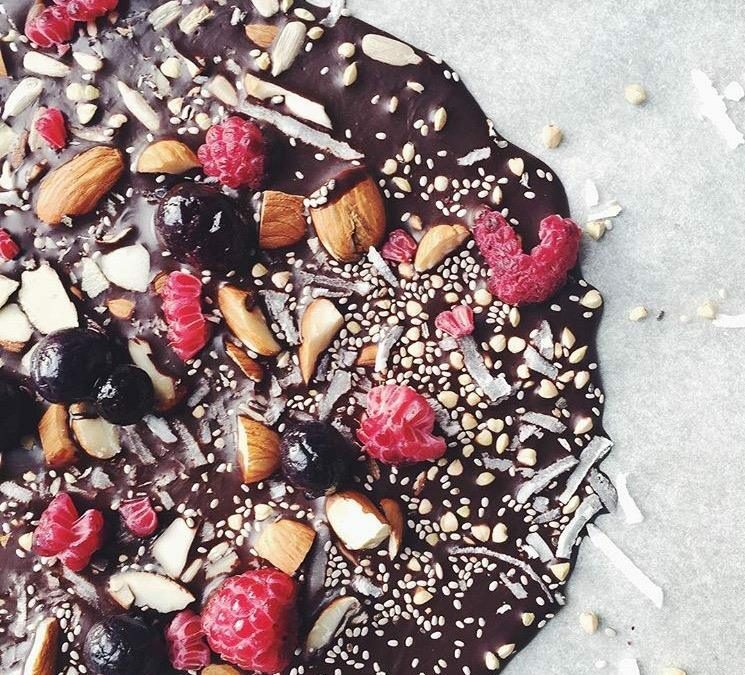 Top with your favourite superfoods then refrigerate until set (about 2 hours) before breaking up into bark to eat! Is this calling for cacao nibs or cacao powder? All I have is cacao nibs!